Netherlands. Two years ago, we organized a very successful demonstration for the people of Nijmegen to welcome migrants. It was a clear signal for freedom of movement, against racism and in for solidarity without borders. Two years later, with the election victories of the PVV and FvD in the Netherlands, the AfD entering the Bundestag, and Trump ascending to the presidency of the United States, it appears that support for right extremist ideals has received a new boost. In recent years, racist intimidations and violent attacks on Muslims, migrants and people who expressed themselves against racism have increased dramatically. In the Netherlands, this was seen in the way anti-racist activists like Sylvana Simons were treated, in violent attacks on refugee centres, and in recent actions against Muslim schools, mosques, and community centres. In Nijmegen, a Pegida demonstrator climbed onto the stage at the ‘Nijmegen Against Hate’ manifestation, and there, of all places, he succeeded in spreading his hateful message. Right extremist protesters of Nijmegen Rechtsaf have also tried to disturb two gatherings against the racist caricature of ‘Black Pete’. Unfortunately, these are not just incidents. Racism is clearly still part of Dutch society. This country has never really risen above its colonial past and is still profiting from it. Capitalism, nationalism, colonialism, racism and fascism: the one cannot exist without the other. Symptoms of the omnipresent institutional racism include police violence, the European Union’s anti-migration policies, and the way migrants and their descendants are being disadvantaged. People without papers are being increasingly marginalized, and so are people who are trying to support them. Member countries of the European Union are making deals with Libya and Turkey to stop migrants before they can even reach the Mediterranean. People migrate for many different reasons, but for a large part, those reasons can be traced back to Western economic and foreign policies. But let one thing be totally clear: to us, no reason to migrate is illegal. We stand for freedom of movement for all people, regardless of (socio-economic) status, gender, religion or skin colour. 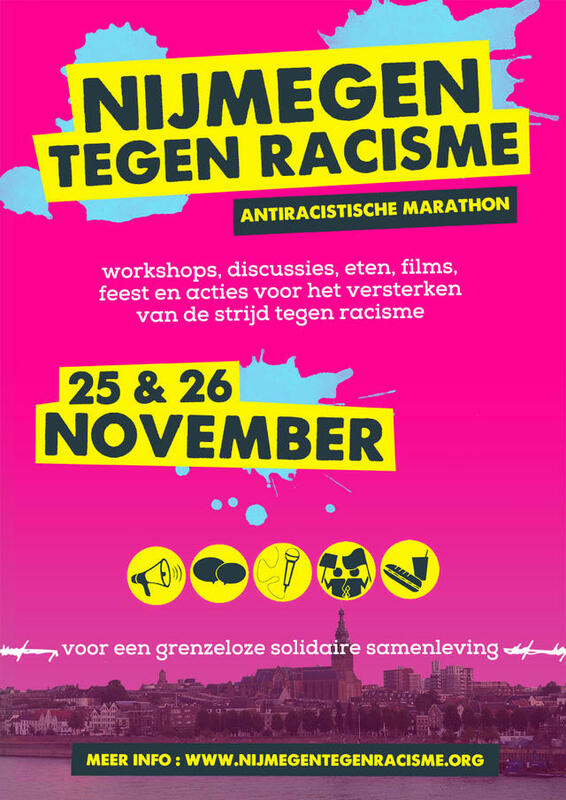 To fight, together, for a world that makes solidarity without borders its first priority, we will organize an anti-racist marathon on the 25th and 26th of November, with workshops, discussions, food, movies, parties and actions to strengthen the fight against racism. We can’t expect anything from the established political order. If we want to stop racism and halt the rightward shift, we must take the initiative ourselves, and tackle these problems together, from the bottom up. By coming together in the streets and strengthening our mutual involvement, we can start to advocate a realistic alternative. Everybody should be able to live in safety, solidarity and social security! Please keep an eye on the following website for more information. Urgent! We need your support to organise and provide mutual aid on Lesvos and in Athens. Please support! Some of the Enough is Enough team will join Cars of Hope to support refugees on Lesvos and in Athens in December and January. They will arrive on Lesvos at December 17. The work of Cars of Hope is based on mutual aid and one of the groups they will cooperate with on the Greek island is the No Border Kitchen Lesvos crew. Cars of Hope needs your support for their work with refugees on Lesvos and in Athens. You can support them with direct donations on their Paypal account carsofhopewtal@gmail.com or by joining the Cars of Hope crowdfunding campaign (Donations by bank transfer or credit card) at: https://www.leetchi.com/c/soziales-von-cars-of-hope.